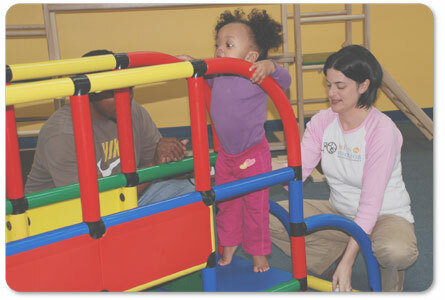 Our occupational therapists help your child—through play activities—improve his or her independent function. Our goal is to help your child function better physically, emotionally, academically and socially in his or her daily activities. Occupational Therapists at Kids in Motion Pediatric Therapy are certified in administration and interpretation of the Sensory Integration and Praxis Tests (SIPT). Please contact us for additional information. Your child’s treatment plan will be based on his or her exact needs. Kids In Motion also offers school-based occupational services designed to help each child achieve his or her full potential and improve the child’s functional ability to access classroom curriculum and school environments. Our school-based occupational therapy services begin with an evaluation of the child’s ability to participate functionally in school activities. Assessing mobility and the ability to use classroom tools appropriately. Assessing potential processing difficulties affecting attention, regulation, modulation and discrimination. Assessing spatial relationships, figure-ground perception, form constancy, body scheme, and orientation to time and place. Assessing problem-solving, organizational skills, attention and appropriate interaction with peers and adults. To set up an appointment or for additional information, please email the center or call 310.371.8555. ©2014 Kids in Motion Pediatric Therapy. All rights reserved.